For most people a trip to Vegas is a once in a lifetime proposition. Face it, you are going to Vegas to gamble and have some fun. It doesn’t need to cost an arm and a leg and with the following money saving tips you can now hit the card tables with a bigger bankroll. 1. Plan ahead – Plan your trip in advance. Most of the major air carriers offer steep discounts on fares that are bought weeks in advance of departure. 2. Book your room online – You can get a $500 room in Vegas for $50 if you do your homework. Casinos will offer cut rate prices on rooms, because they want you to gamble on their property and not elsewhere. A cheap room is an enticement to do so. 3. Plan your meals – Prime rib, steak and lobster dinners can be enjoyed for $10. Check your in room coupons. When you are out on The Strip keep your eyes open for the neon marquees. Most resorts have buffet specials. A healthy meal can be found. You might want to purchase a Las Vegas Entertainment Book before you leave for your vacation. 4. Take the time share tour – No, you don’t want to buy a time share but 1 ½ hours early in the morning won’t interrupt your vacation. This is the ideal place for free show tickets and free meals. If you do buy the time share you are at least guaranteed a free ride in a limo. 5. Sign up for the players card – If you are a slots player sign up with your favourite casino. Plug your player card in the casino slots for that extra $20 you’ll have to play with. Sign up usually includes a free meal and discounts for Vegas attractions or shows. 6. Free Wifi in Las Vegas – Need to go online? Save the $20 that most casinos charge for unreliable Internet use and use the free WiFi that is available at McCarran Airport while you wait for your flight connections or the limo to your casino. The Monorail is also WiFi friendly and is a great place to check your email as you ride in comfort from one end of The Strip to the other. 7. Pack less – You don’t need as much as you think in Vegas. Pack an extra bag instead and load up on souvenirs and clothing from the various outlet malls in town. Free shuttle service is provided. 8. Know your destination – Vegas cab drivers have been known to take circuitous detours. You can save ½ your cab fare if you know where you are going and recommend your preferred route to your driver. 9. Be seen – If you like to enjoy your drinks for free make sure that the hostesses can see you and don’t hop from card table to card table or from one slot machine to another. Tips will ensure that your hostess comes back with regularity, unless you prefer spending $14 for a Vodka and Red Bull. 10. Wear comfortable shoes – While this won’t save you money, The Strip is longer than you think and comfortable footwear will make you less tense when you find your poker table. Happy feet can lead to peace of mind and is one less thing for you to think about at the card tables. 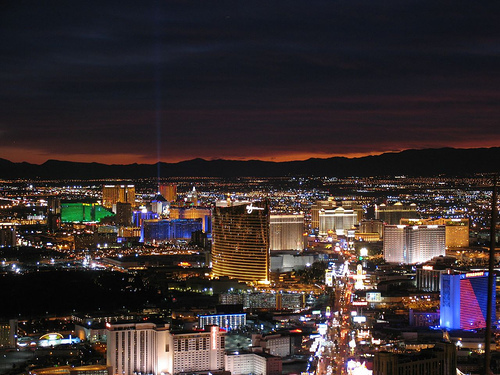 These tips can save you up to $3000 for a week in Vegas. You will have already saved up to $1500 by the time you leave home. That’s money you can take to the bank! This article was written by a Mr. Cheap Stuff contributor, have a tip or article you would like to submit, please contact me.